The economic and humanitarian crisis in Venezuela is the predictable result of statism run amok. And I will confess a bit of Schadenfreude has suffused my columns on the topic. I very much enjoyed mocking leftists who have tried to rationalize Venezuela’s economic collapse. I gleefully compared Venezuela’s long-run stagnation with South Korea’s long-run economic boom. I mocked the Venezuela’s economy for being so weak that prostitution is one of the few thriving sectors. But we shouldn’t laugh at the collapse of statism. Real people are suffering. And even if a painful collapse is necessary to create the conditions for a rebirth of freedom in Venezuela, the widespread misery that now exists is still tragic. So let’s set aside sarcasm and try to draw a very important lesson from the crisis. Moisés Naim of the Carnegie Endowment and Francisco Toro of the Caracas Chronicles have a column in the Washington Post about Venezuela’s collapse under Chávez and Maduro. They point out that ordinary people are the main victims of the nation’s statism. Venezuela is the sick man of Latin America, buckling under chronic shortages of everything from food and toilet paper to medicine and freedom. Riots and looting have become commonplace, as hungry people vent their despair while the revolutionary elite lives in luxury. Not long ago, the regime that Hugo Chávez founded was an object of fascination for progressives worldwide, attracting its share of another-world-is-possible solidarity activists. …the time has come to ask some hard questions about how this regime — so obviously thuggish in hindsight — could have conned so many international observers for so long. The authors answer that question in two ways. Chávez pioneered a new playbook for how to bask in global admiration even as he hollowed out democratic institutions on the sly. …he mastered the paradoxical art of destroying democracy one election at a time. Venezuelans have gone to the polls 19 times since 1999, and chavismo has won 17 of those votes. The regime has won by stacking the election authorities with malleable pro-government officials, by enmeshing its supporters in a web of lavishly petro-financed patronage and by intimidating and marginalizing its opponents. It worked for more than a decade — until it didn’t work anymore. In other words, the Venezuelan left sometimes won by rigging the rules, which is obviously bad. But Chávez and Maduro sometimes did win genuine majorities. Those outcomes, however, were only made possible by bribing voters. 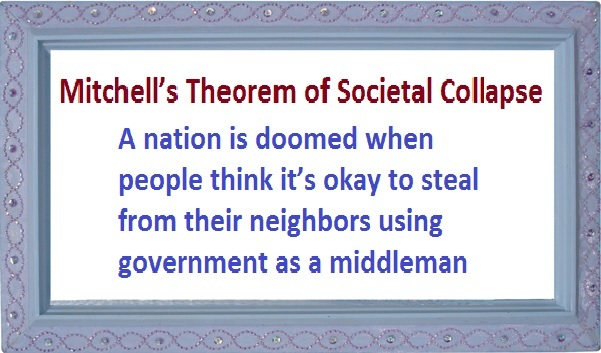 People were seduced into stealing from their neighbors as part of a process that produces ever-larger sclerotic government. This is the untrammeled majoritarianism that America’s Founders tried to avoid with a Constitution limiting the power of government. In the absence of societal ethics, it’s not a good idea to let two wolves and a sheep vote on what to have for lunch. It has destroyed Venezuela. It’s destroying Greece. It’s what makes me pessimistic about the future of nations as diverse as Brazil, Italy, and South Africa. And it’s the biggest long-run danger facing the United States. Let’s close by noting that type of system is very beneficial for powerful insiders. Chávez successfully cultivated a pro-poor, anti-American posture . Endless professions of concern for the poor… But this, too, was a charade. We now know that the fiery speeches professing unconditional love and support for the poor were a ruse to deflect attention from the wholesale looting of the state. In fact, more than $100 billion in oil profits stashed in a “National Development Fund” were simply never accounted for. …regime-connected politicians run their luxury yachts aground after drunken romps. …You would think that preying on the world’s largest oil reserves would be enough for even the most voracious of kleptocratic elites, but no. The regime is also deeply involved in drug trafficking. In other words, big government is very profitable for the insiders of Caracas just as big government in the United States is very profitable for the insiders of Washington. P.S. I will admit that majoritarianism works when voters are knowledgeable and ethical. Switzerland is a very good (but very rare) example.